Taj the Genie is a blue elephant and a genie who lives on Timber's Island. He only appears in Diddy Kong Racing and its Nintendo DS remake, Diddy Kong Racing DS. Tiptup racing Taj in the Plane Challenge. 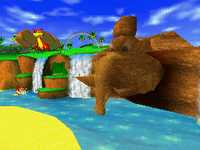 In Diddy Kong Racing, Taj's role is assisting Diddy Kong and his friends in banishing Wizpig from Timber's Island. At the start of the game, Taj introduces himself to the player, as the "genie of the island". His main purpose is providing the player with a Golden Balloon after winning a challenge for the first time, either a course, a Silver Coin Challenge, or one of his own vehicle challenges. He also rewards the player with a T.T. Amulet piece if they complete a specific world challenge. Taj rides on a red, magic carpet for transportation. He also provides a hint to the player after obtaining the first two Wizpig Amulet pieces, from Tricky and Bluey respectively. Each of Taj's vehicle races occur later in the adventure. The first challenge involves the player racing him in a Car, then in a Hovercraft and lastly in a Plane. Taj is always seen walking around a grassy patch in the center of Timber's Island. The player can get his attention by either bumping into him or honking their horn nearby. By getting Taj's attention, he gives two options on a menu: changing the current vehicle on Timber's Island or retrying one of his vehicle challenges. When the player exits the option menu, Taj says bye to them, and vanishes in a puff of smoke. He returns to roaming around the grassy field of the world map. After beating Wizpig in the first race, Taj and T.T. congratulate the player. Taj and the playable characters all party in the beach portion of Timber's Island, before being interrupted by Wizpig. Taj also appears in the second ending, after Wizpig's second defeat. He is also seen celebrating with the playable characters and the four bosses. The carving of Wizpig's head on the frontward mountain of Timber Island was replaced by a gold replica of Taj's head. Taj's head replaces Wizpig's on the mountain during the game ending. Taj also appears in the remake, Diddy Kong Racing DS. Aside from his usual role, Taj also appears as a newly unlockable character, and can be unlocked after the player completes the first Adventure Mode. Taj has maximum top speed but minimum acceleration and turning; his stats are shared with Wizpig, who is also unlockable in the remake. If the player talks to Taj as the playable equivalent, he believes to be going crazy from talking to himself, but decides to offer assistance regardless. Taj originally had an Indian accent, which was changed to British in the remake. Taj does not have as much dialogue, since he does not have lines when introducing himself at the start or in the sequence where he awards a Golden Balloon to the player. Originally, from his options menu, Taj would offer to further assist the player after they selected an option. However, in the remake, Taj only allows them to select one option before vanishing. Taj hosts two additional challenges in the remake: a challenge where he competes against the player to first obtain ten Taj Tokens and a challenge where the player must blow out every torch in under a minute. Taj also hosts the newly added Wishes Menu, where the player can purchase unlockable features with their collected Coins. In the game ending, the gold replica of Taj's head was altered to receive the same rocky texture as the mountain side. Taj was set to reappear in the canceled Nintendo GameCube title, Donkey Kong Racing. At first, he is shown to be riding on a small red Rambi, then a later segment shows him and Donkey Kong racing on a Zinger through the forest. At the end of the trailer, the slogan "Let's Ride" displays, which Taj flies past on a Zinger. For this subject's image gallery, see Gallery:Taj the Genie. Taj could have possibly have been inspired from the real world Indian elephant, considering his basis from Indian culture. The first use of the name "Taj" in the Mario franchise actually appeared on Tetris Attack's high score board. A taj (تاج, from the Arabic word for "crown") is a brimless hat worn by people from Muslim countries. However, it may be a reference to the Taj Mahal, a palace in India. An unused music file in the data for Diddy Kong Racing features the player select theme played on Indian instruments. This could mean that Taj was planned to be a playable character at one point in development. This page was last edited on January 15, 2019, at 20:45.